Crossing the Rhône River to go to the organic farm on the Barthelasse Island for my weekly food shopping is without a doubt one of my favourite things to do on my time off. And what a pleasure to visit the farm in the middle of summer when they have all the delicious, sun-kissed fruits and vegetables that we love in Provence: courgettes in different sizes and colours, aubergines, peppers, nectarines, cantaloupe melons… It is just the best time of year to cook! For the last few years, there has been a big tomato trend in France and in Europe, more generally speaking. Indeed, not so long ago all you could find on the shelves were the Roma (long shaped) and Vine tomato varieties but today you could count the varieties by dozens. In France, they are known as ‘Tomates Anciennes’ (literally old tomatoes!) and they come in all sorts of shapes, colours, sizes and they all have a unique flavour. It is a real delight to see them on the displays at the farmers markets at this time of year, as they are wonderful ingredients for summer recipes and bring unique colours to our dishes! Bright yellow, striped green, dark red… your salads become works of art! There’s a recipe I have wanted to make for a while now, but I decided to remain patient as I wanted to make sure I would get the best possible tomatoes, ripened in the hot Provence sun. And, as I went to the farm yesterday and saw all the colourful, gorgeous looking tomatoes, I knew there was no need for me to wait any longer. For me summer is about simple recipes that are quick to make, as I want to make sure I enjoy my pre-dinner drink (preferably a glass of Rosé!) on the balcony while the sun is still out, therefore I choose recipes that don’t require a lot of preparation, but still are full of flavours. 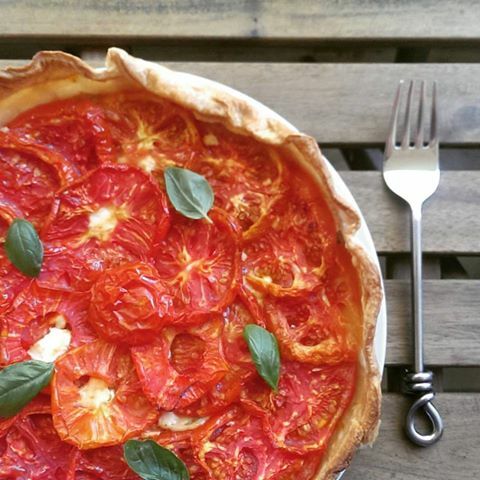 I found the recipe of this tomato tart in a Provençal cooking book that I will review in a later post. Unlike the traditional tomato tart that calls for Dijon mustard, this one is made with a basil and mascarpone filling. Rich puff pastry, creamy mascarpone, fresh basil and ripe tomatoes? Sounds good to me! Roll the puff pastry to a circle slightly larger than 30cm and let in rest in the fridge while you prepare the tomatoes. Remove the cores from the tomatoes; slice them about 5mm thick. Mix the mascarpone cheese with the parmesan and basil and season well. Spread the cheese mixture across the centre of the pastry leaving about 10cm at the edges. Layer the sliced tomatoes around the outside of the cheese making a full circle. Continue towards the centre in ever-decreasing circles. Drizzle with olive oil. Bake the tart in the preheated oven for 30min, then turn the oven down to 150°/300°F/Gas 2 and bake for further 45mins. The tart can be eaten warm or at room temperature.